Due to financial constraints and medical bills, there are several dozen homeowners currently seeking support from Lee BIA Builders Care to help with air conditioning replacements in Lee County. In response to the tremendous need, local air conditioning company, Bruno Air has partnered with Builders Care this summer to provide assistance. Ken Streeter is a 58-year-old Army veteran who served honorably for over 19 years. He suffers with multiple sclerosis and diabetes and is unable to work. His social security income alone does not allow him to pay his bills and maintain his home. Streeter purchased his quaint 900-square-foot home, located in the City of Fort Myers, at a significantly reduced rate, with an aged central air conditioning unit. For the last several years, Streeter has repaired the unit with used parts to keep it going. Within the last few weeks, the system died completely, but he is unable to afford a replacement. 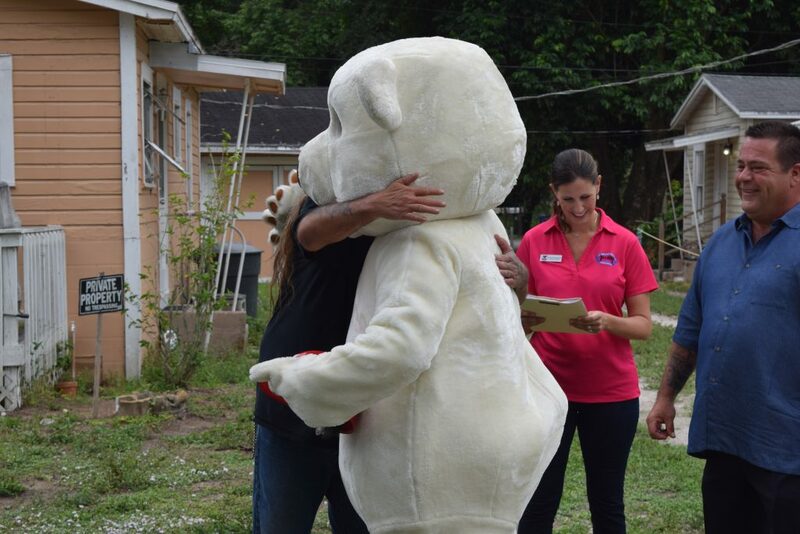 On June 2, Ken’s wish was granted when team members of Bruno Air marched down the street with Builders Care staff and board members to surprise him with materials to replace his broken air conditioner. Thew new 2-ton unit that will be installed will help Ken live comfortably during the approaching warm summer months. The replacement job was completed in just one day. “I am thankful for this help. It’s nice to be able to help others in our community and know that they are also here to help me when I need it the most,” said Ken Streeter in response in the activities taking place today. Bruno Air provided the equipment and labor to complete the air conditioning system installation. All services and products were provided at no charge to the homeowner. “With growth comes the responsibility of giving back to the community and taking care of our veterans who have taken care of us”, said Louis Bruno, CEO of Bruno Air. During the summer months, Builders Care receives an increase in the number of air conditioning requests and is currently seeking additional support. Businesses who wish to provide materials, services or financial support can contact Christi Pritchett Sarlo, executive director, Lee BIA Builders Care. Builders Care is the nonprofit charitable arm of the Lee Building Industry Association (BIA). Its mission is to provide emergency home repairs and construction services to elderly, disabled and economically disadvantaged people who are unable to obtain home repairs through traditional means. To date, Lee BIA Builders Care has put more than $4 Million in construction services back into the community at no cost to homeowners in need. 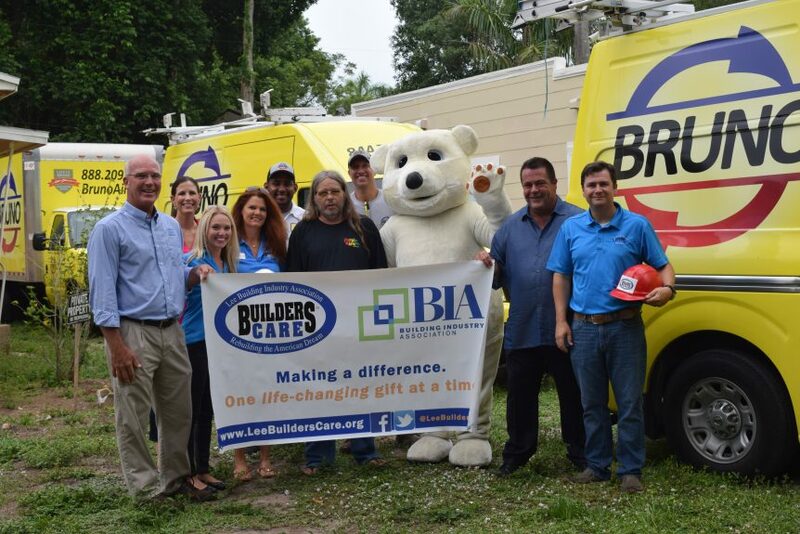 Builders Care enlists the volunteer services of Lee BIA members and leverages grants and donated materials to provide construction and remodeling services to qualified homeowners throughout Lee County. Builders Care is headquartered at the Lee BIA offices at 10501 Six Mile Cypress Parkway, Suite 118 in Fort Myers. The Building Industry Association (www.BIA.net ) is a 62-year-old association affiliated with National Home Builders Association and Florida Home Builders Association that serves to strengthen our community by advancing a professional building industry through advocacy, education and services. Donations can be made online at www.LeeBuildersCare.org, or to the Builders Care general fund at BB&T Page Field branch at 4959 South Cleveland Ave. in Fort Myers. More information is available by calling 239-938-0056. Follow Builders Care at Facebook.com/LeeBuildersCare or on Twitter @LeeBuildersCare.